A little of the mystery–solved? “From the 1930 Census. Ruby Scofield Doyle was the wife of Thomas J. Doyle. 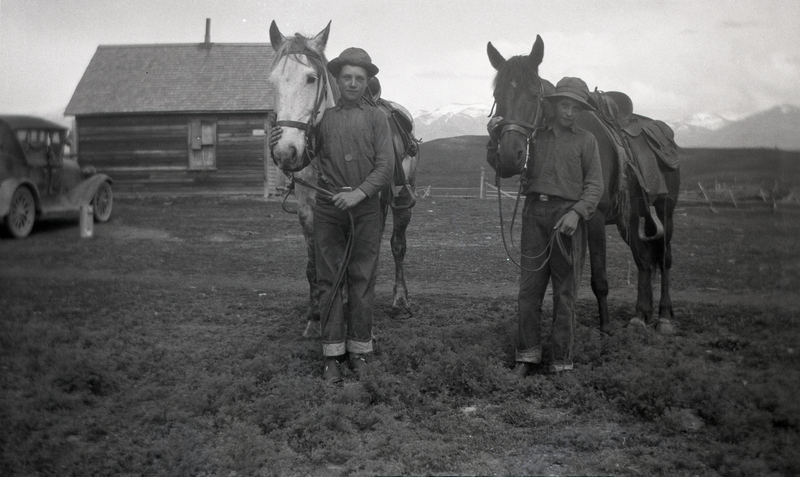 According to the 1919 Missoula City Directory T. J. Doyle was ranching at Clearwater at that time. Dorma Doyle was born March 16, 1922. She married Harold A. Hardy on June 18, 1947 in Kalispell. Hardy died in 2001. They had no children (at least none that the funeral home knew about.) There was only a death notice, not an obit for Harold. Can little Dorma Ruth still be alive? She would be 92 years old now! Does anyone reading this blog have any information? If yes, we hope she is in Missoula. Donna would very much like to share these diaries with Dorma or any family members who are interested. Please contact the U. of Montana Maureen and Mike Mansfield Archives if you have any helpful information. Dear Readers: I’m putting this blog aside now. Got a job in Boise, Idaho and am leaving shortly for a new adventure. Thanks for hanging in there with me for so long, for your interest and insights and humor. This was my first shot at blogging and you’ve made it special. 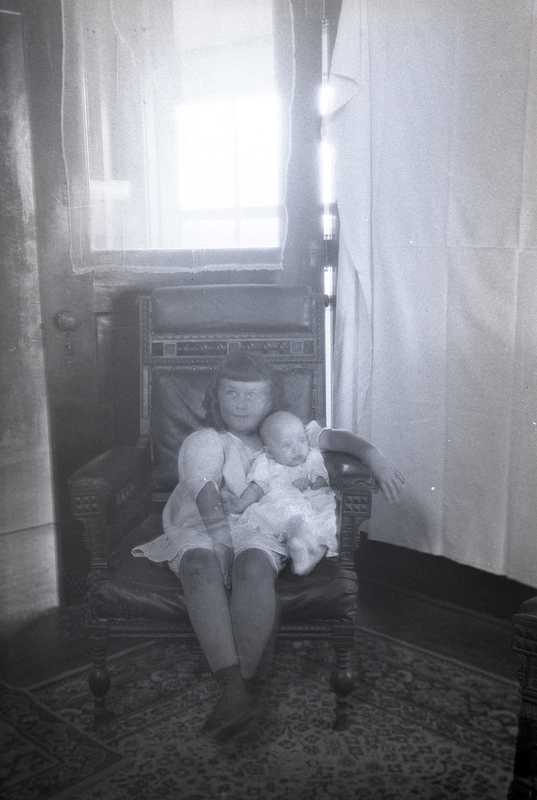 Please see my earlier posts today for all the remaining photos that were salvaged from the dumpster; they are beautiful, funny, charming, and a little haunting. I hope you enjoy them as much as I do. These wonderful diaries, and scans of the photos, now reside in the University of Montana Maureen and Mike Mansfield Archives—forever safe, I hope, from the ignominy of french fry grease and beer bottles in some back-alley dumpster. Please go visit them there, along with a transcript of the first diary. The other three remain untranscribed. I would like to thank an anonymous salvager, John at Circle Square Antiques, and Donna at the University of Montana for seeing the value of these diaries and photos. 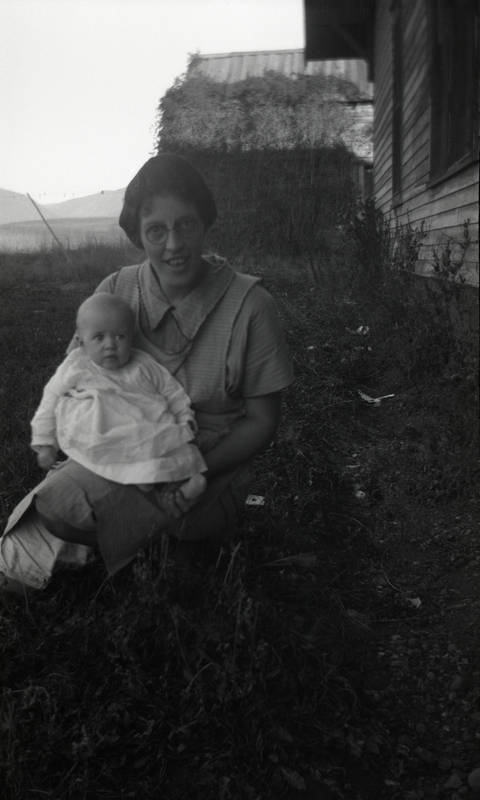 If anyone recognizes a family member I hope you will contact the University of Montana Archives. If diaries like this were written by my ancestress I know I would certainly wish to read them. I confess I am a little teary-eyed as I type this farewell. The mystery and drama of another person’s life and loves, the world she lived in that was so different from ours and yet so alike, really brought me deep into the heart of western Montana. It’s hard to leave. Can you write a love letter to a state? Maybe not. But a love letter to a state of mind; yes I can write that. That was this blog. 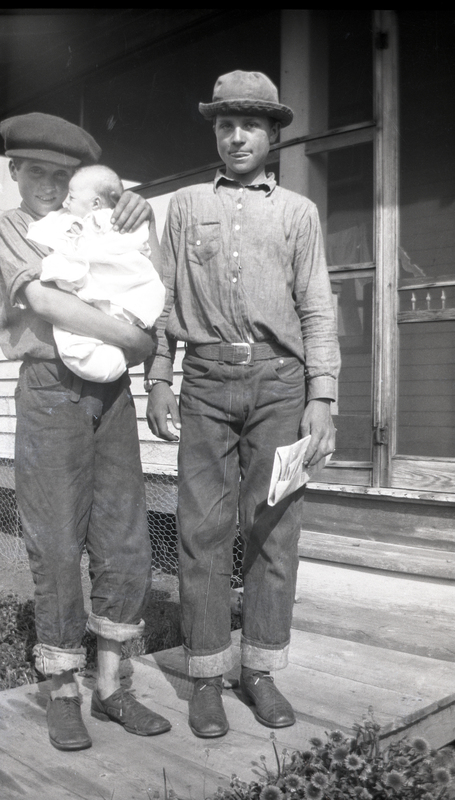 Two young gentlemen with their trusty mounts (and an old rattle-trap flivver in the background). I’d take my chances with the horses! The house in the background, with the pasture leading the eye into the low hills and then snow-capped mountains in the distance, are pretty much the soul of western Montana. 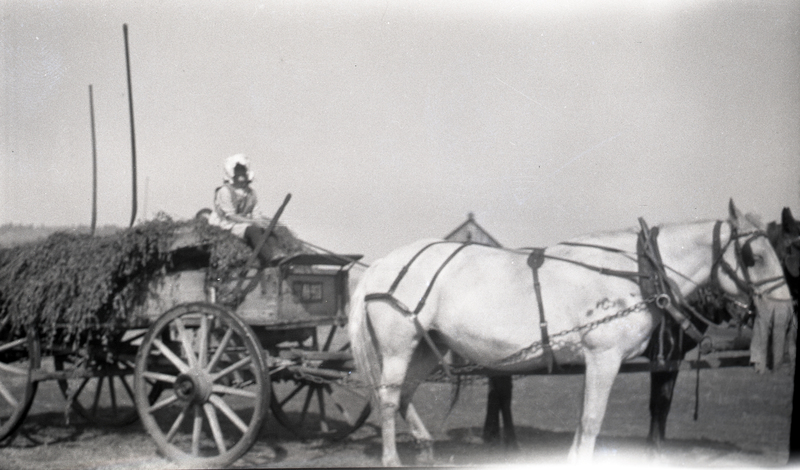 A young lady wagon-driver — in a bonnet. I can’t tell for the life of me what she’s hauling in that wagon, can you? The horses have their nose-bags on, and look pretty contented. So, I’m guessing that’s Dad and Jay on the left. What could they be hauling in that barrel: molasses? Sorghum? That’s a neat sledge they’re using. 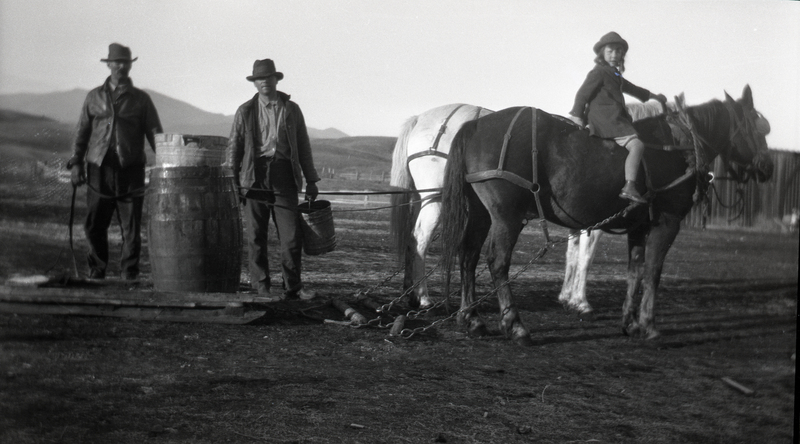 Anyhow I think the young lady on the horse is the same who is holding Dorma Ruth on her lap in other photos. Can this young lady be a cousin to Dorma Ruth? Or a big sister, a step-sister? Their comfy pose together suggest family. Getting dirty is the cat’s pajamas!! –like they used to say in the Jazz Age! 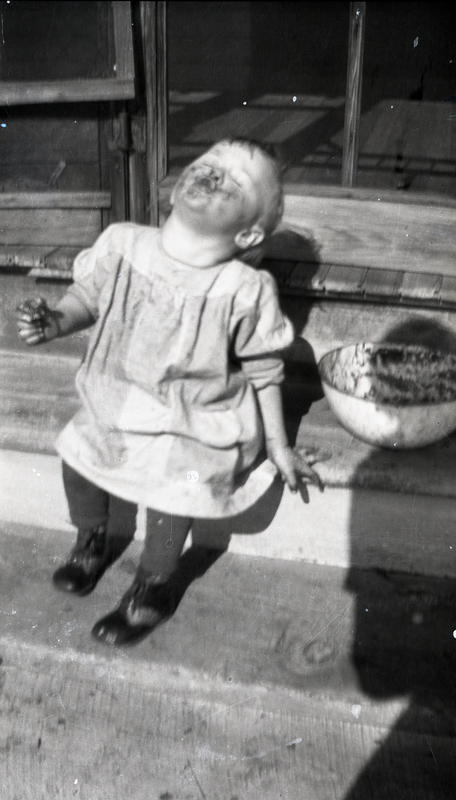 In this photo a somewhat older Dorma Ruth revelling in a pleasant afternoon on the steps getting ‘into’ something delicious. What do you think it is: chocolate cake batter? Maybe some ripe berries? Never too young to catch up on your beauty rest. 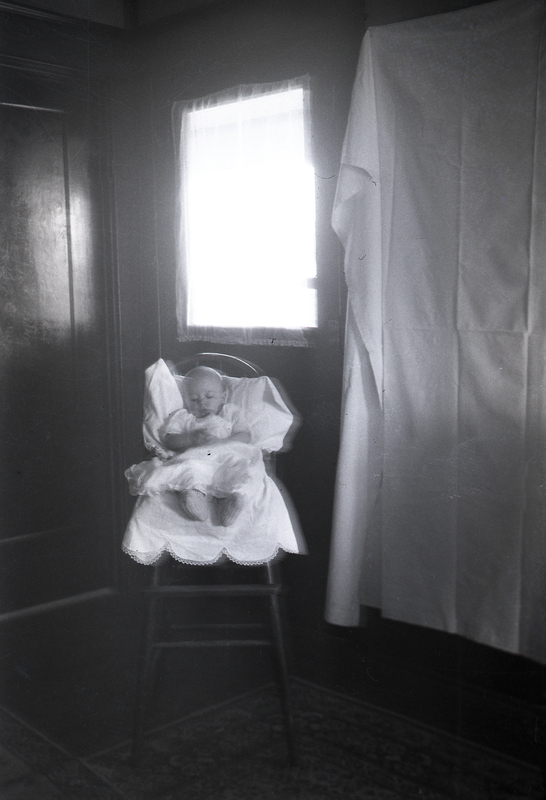 Dorma Ruth chillin’ out in her high chair in a sunny corner of a quiet room. Who are these handsome young men? Two young boys are getting some practice holding a very young Dorma Ruth out in the sunshine. She’s putting up with it well! 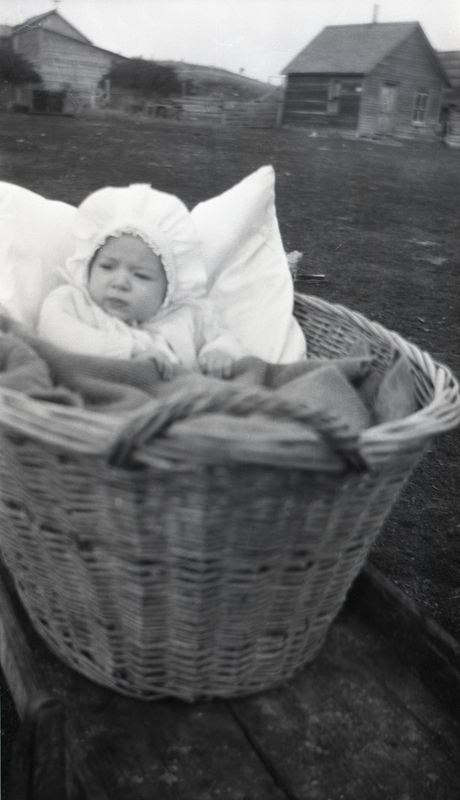 The first in a series of photos found in the dumpster with our mystery diaries–this one is a real charmer of a baby (let’s just call her Dorma Ruth) sitting peacefully in her special basket.